From My Front Porch: How do I sleep at night? I'm not gonna lie some nights not very well - but it isn't for the reasons you accuse me of! "Helping with hog chores tonight! #myboots #hogfarmerswife"
"UH OH - fooled the heat check boar the first time but not this time - not bred not good!" "She's a good sow putting her energy into nursing her piglets but she was looking a little thin so she gets an extra scoop of SOM for additional protein tonight! #farmsmatter #farmerscare"
"Babies all warm and comfy #babybacon"
"I am not a vegan but I believe that even animals raised for food deserve a good and merciful life. Standing on a metal grate next to their mama who can barely move is not anyone's idea of 'comfy'. Don't know how you people sleep at night." Well honestly, a lot of nights in the dead of winter and in the horrible heat of summer I don't sleep well - I worry about the 10% of our sow herd on outside lots. This winter we have had several sows get frostbit ears and we lost a sow to prolapse because all the sows in her lot laid in a pile for warmth, she was on the bottom! And in the summer keeping them cool is just as big a concern for me. But how do I sleep knowing that my 90% of our sows and all our other pigs are safe and comfortable in confinement barns - like a baby! This little piggy is sound asleep! Chris texted me this picture the other day as he was checking on farrowing sows - this baby looks mighty comfortable to me! 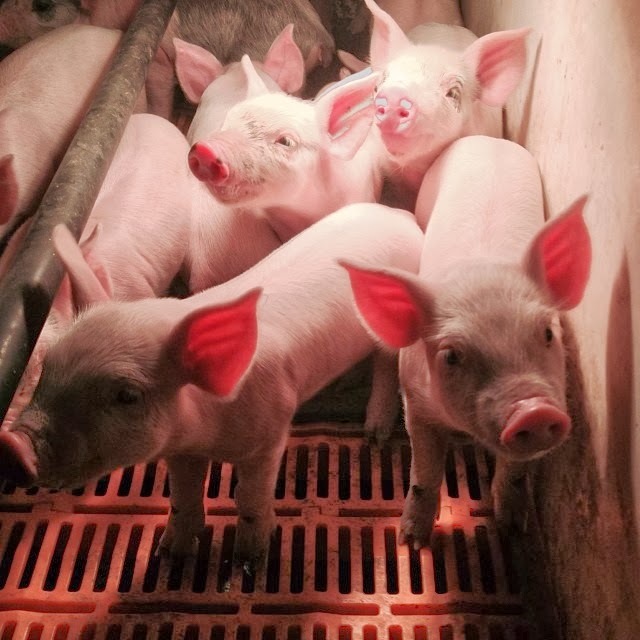 They are not on metal grates - it is plastic flooring, the manure falls through to a pit so that they don't have to sleep in it, there are mats under the heat lamps for comfort and to keep them warm. Momma sow is in a farrowing crate so that she has space and so do her babies, she can't lay on them and kill them accidentally. Her feed is monitored twice daily, if she is putting her energy into nursing than she gets a little extra. So how do I sleep - I sleep fine - my livestock is given a good and merciful life - when temperatures drop the thermostats in all our hog barns are higher than in our home and when the electricity goes out the only generator we own runs down at the hog barns not at our house! So ask me how I sleep at night and I will tell you peacefully know that our livestock is well cared for! Considering the weather we have had going on outside, I enjoyed your pictures and I too thought your hogs looked warm and cozy! What do people want you to do? Throw those little guys into a pile of snow and expect them to be "free range" in these harsh temps. I cant imagine how you think that the baby pigs look comfortable. They are away from their mother, and the poor mama pig is ina crate. I think it's disgusting. I don't KNOW how you sllep at night breeding these poor pigs for slaughter. To label "babybacon" under their picture, makes me sick. Our cattle stay outside because they have the ability to grow long hair and resemble Yaks. I've not seen hogs able to do this. Even my dog is pretty darned happy when we let her in the garage at night! Keep educating the peeps Miss Jent! You keep your dog in the garage at night. That's pretty disgusting!!! I am glad you are sharing your story. We no longer raise hogs but a farmer cannot neglect his animals and make any profit. It won't happen. Farming is an expensive venture. Farmers are raising and growing good healthy food for the Amercian consumer and I believe they should be more appreciated. They do look very warm and very cozy! Great post Jent! Takes me back to the days that we raised pigs and it is a lot of work to keep them comfortable and you do make sacrifices for them. They are family until they are gone and loosing them to these conditions is not to be taken lightly. Don't judge until you have walked in the boots of a hog farmer. Thank you so much for sharing this story. We are grain farmers and know NOTHING of animals. From the little I do understand is that pigs are very hard to temperature regulate and I don't think people get that pigs couldn't survive outdoors in the winter! From a fellow hog farmer - love this! I sure sleep better knowing our little babies are warm and comfy in their big bad confinement barns - with their warm mats, 70 degree rooms, and all you can eat feed! I sure wouldn't want to be a pig outside in this weather! I actually had a student who worked for me that accused us of not caring because of the farrowing crates and the floors they were on. People don't understand that if not for those floors they would all be wallowing around in all the feces - and that having those floors actually helps to keep mama cool while the babies stay warm. I like this post too, Jent! Simple explanation for why you do what you do. 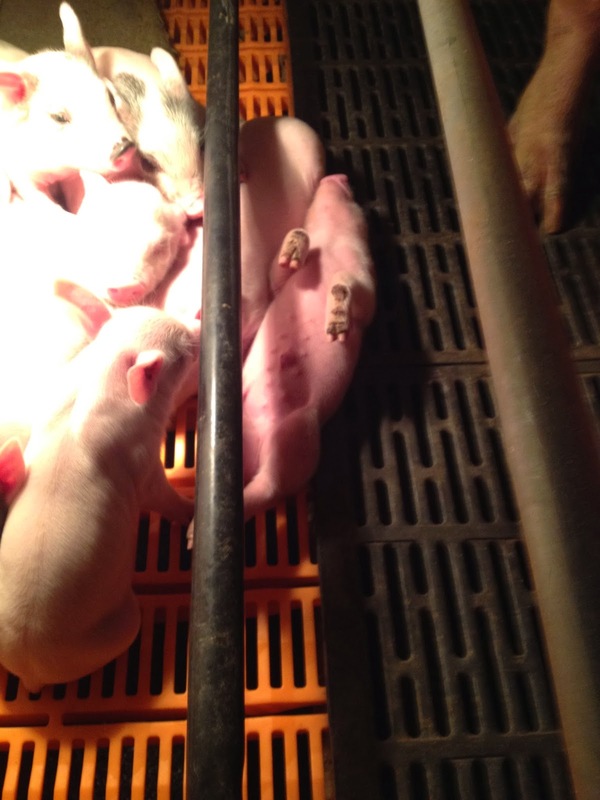 Gestation/farrowing crates are important for the safety of pigs. The average person doesn't realize how mean some sows can be. Your pigs are clean, warm, well fed and cared for what more can one ask for? I think it's important to keep agvocating, but there is a certain amount of people that will never open their minds or eyes to the truth. Or realize how well animals are cared for. The lesson that we need to see is the importance of keeping our mind, eyes and hearts open. Keep up the good work, on the farm and advocating for ag! Love this blog post. I don't sleep a lot of nights very well because we are calving and need to get up every couple of hours to check on the cows that are calving. I am glad that your piggies sleep so well. Keep up the great work raising that bacon! It's easy for misunderstanding and mis-communication in the modern social media environment. Folks see photos they don't know how to interpret (i.e. thinking that your flooring is metal grates) because they've never been to a hog farm or lived in a farming community. Keep trying, Jen; I'm grateful to see down-to-earth farming families represented on the internet.